Outside the White Hart Tavern, Moira pulled her coat about her with an instinctive look around. With the late hour, the streets had grown considerably more empty. The sour stench of rotten vegetables rose from a nearby alley and mixed with the musty, animal smell of cattle from nearby livestock market grounds only a few yards away. 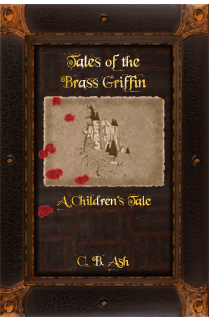 Moira wrinkled her nose, stepped away from the door, then stopped when an uneasy feeling came over her. She looked around again and squinted into the evening’s smokey gloom. A pair of fishermen, based on their oilskin coats and thick boots, lingered in a doorway lit by the feeble glow from gaslights along the street. They paused in their conversation to stare when she stepped from the tavern and onto the street. A moment later, as William emerged from the warm light of the inn, their conversation picked up again in lower tones. He too, noticed the decided lack of people and shivered. Moira tugged at his sleeve. “We’d best hurry.” Moira said, turning to trot down the road to catch up to Captain Hunter and the young lady with him. William nodded and followed after. When they caught up with Lydia and Captain Hunter, they were at the western edge of the Grassmarket where it joined with King’s Stables Road and West Port Road. The intersection was barely a few yards from the inn itself. Above and uphill from them, Edinburgh Castle loomed dark and large. It dominated the skyline, its ancient stonework stained with unexplained damp streaks from ages past. Battlements thrust up from the shadowed granite like jagged and broken teeth yawning wide at the night sky. These shadows stretched in long lines over the road, casting part of the corner in deep shadow where a faint whisper of hushed voices carried on an illicit deal, then faded to nothing. Only a lone gaslight stood vigil on the corner beside Captain Hunter and Lydia, struggling to surround them with a soft, safe glow. The captain sighed, a sudden realization dawning dawning upon him. “I’m a clod. Please forgive my lapse of manners, Miss Olivander. 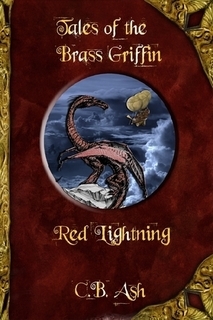 My name is Anthony Hunter, captain of the Brass Griffin.” Hunter said in introduction. He smiled a little with a polite nod, to hopefully ease her fears. Moira and William stopped just behind Captain Hunter at that moment. “Aye, and a fine one she is,” Moira grinned. We’re with the Cap’n. I be Moira Wycliffe, and that there’s William Falke.” She explained with a jerk of her thumb at William. William nodded with a nervous look around at the darkness. “True enough,” he replied. The young man was no stranger to the more run down and tired areas of cities like Edinburgh. Without a moment’s hesitation, Captain Hunter nodded to Lydia, stepped off the curb, slipped around two hansom cabs, and walked straight out of the Grassmarket and onto West Port road. “But .. Sirrah … Cap’n Hunter … Sirrah?” When the captain did not even pause, Lydia looked at Moira and William helplessly. “So, Allison be yer friend, right? What would she be doin’ out in a place like here at night?” Moira asked quickly in an effort to return the conversation back to one over which she had more control. 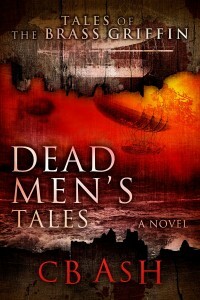 “How long has she been missin’?” William asked, stepping around a parked horse-drawn cab. “So that explains why you’d risk being out at night.” Hunter concluded thoughtfully. “Anyone tell ya much so far? Like havin’ seen her pushin’ her cart about in the last day or so?” Moira asked hopefully. “What’re we lookin’ for Cap’n?” William asked with a confused look. “Details, Mr. Falke, details. A scrap of cloth from a woman’s blue gingham dress, a distressed patch of ground out of place, something that just does not quite belong. You’ve spent time as a lookout and a tracker, I shouldn’t need to remind you of the weight any detail can play.” Hunter explained with a faint smirk. “Right, Cap’n.” Falke replied with a grin before he looked out at the dark cattle market grounds. On the southern side of West Port Road, the cattle market spread out like a festering wound among the dingy, ill-repaired boarding houses around and to the north of it. During the day, in market season, it was often ankle deep in mire and filth. Cattle and sheep were packed into small pens that sat in the center of the market grounds, and a musky steam rose to mix with the light oily smoke that hung perpetually in the air. Crowds of cattle and sheep owners, butchers, thieves, pickpockets and many others filled the area. The bleating of animals to the roar of voices from the onlookers crashed together in a wave of sounds, sights and smells that was all at once a perfect symphony of chaos. However, at night, it was much different. With the animals and crowds dispersed, only the tired and worn wooden fence posts of the pens stood watch over the mire. A faint musk still rode in the air, as if a specter drifted lazily about, waiting for the overly-curious or unwary to happen by. Shadows from the moon stretched long over the soggy ground in the form of cages and broken wood that appeared like skeletal fingers reaching outward to anyone passing by. To the right side sat a haphazard collection of carts, to the left sat squat, sagging wooden benches for any of the weary visitors during the day. Towards the end farthest from the road itself, stood a small collection of run down cattle sheds framed on either side by a set of heavily stained, wooden buckets. The quartet entered the foreboding market, each taking a section for themselves. While Hunter occupied himself with the cattle sheds, Lydia went to examine the carts, and Moira to the long benches. William was left to search the entrance, then the animal pens that sat in the middle of the bog-like cattle market grounds. One by one, Hunter walked to each of the small wooden sheds and tried the door. As soon as the first door opened, the stench of cattle and sheep rolled outwards in a choking cloud. The captain turned his head and coughed, then proceeded through the door. Inside, the shed was as weathered and dilapidated as it was on the outside. Along the walls thick, coiled rope hung neatly on rough-cut wooden pegs. Next to the rope hung an assortment of droving whips. Hunter pulled open the door wide to allow the moonlight to shine into the room. The sole stretch of light struck a path down the middle of the shed. Well lit enough for Hunter to enter, but not enough to enable him to search it. Reaching into his coat pocket he withdrew a small leather case and pulled out a matchstick. This he struck against the rough wood of the shed’s door frame. Immediately, the match roared to life with a tiny, orange flame. Carefully, Hunter looked around the room, taking in the smallest detail for the hint of a clue. Instead he found only more rope, a fewer number of whips. Once he was done, he extinguished the match before it burnt to his fingers and repeated the entire process in the next shed. Then again with the shed following that one. With each cattle shed that Hunter searched, he came away with nothing more than a burnt match to show for it. His frustration began to show on his face, in his expression and in the way he stalked from door to door like an angry hunting cat. Inside the last shed, Hunter paused at the ropes and whips. “Interesting, one would think they’d take as good a care of the rest of this market as they do the rope.” He turned to make his way back to the door, only instead, he tripped over a cart that had been turned on its side to rest against the wall of the shed. In the darkness, Hunter had missed seeing it upon entering. The captain grabbed the edge of the door frame, catching himself in time before he pitched face forward into muddy ground. “Bloody hell!” He exclaimed, then slowly righted himself. Once back on his feet, Hunter lit another match, squatted down in the doorway and turned the modest-sized cart, easily two feet wide and four feet long, upright on its wooden wheels. 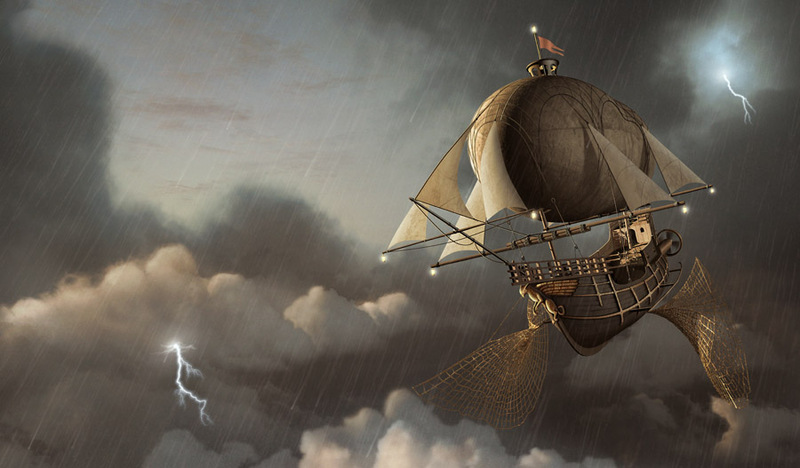 Beneath it, the captain took note of a few items on the ground: a bag of springs, some large bolts for a steam boiler, a few wilted heather blossoms, and several cans of lamp oil. From out of the darkness, he heard running footsteps approaching. In moments, Lydia, Moira and William converged on the cattle sheds. Hunter waved a hand to let them know where he was. Hunter motioned quickly towards the cart that had been hidden in the shed. “Odd that a cart would be left in such a way, when all the others are kept together.” The captain then turned to face towards the stout man hurrying in their direction. “It seems we’ve company.” He raised his voice. “We are no thieves, Sirrah. I am Captain Anthony Hunter. Who might you be, Sirrah?” Hunter called out. On hearing Anthony’s reply, the stout man slowed his pace. His body language told Hunter volumes. The man had been expecting petty thieves, not what he actually found. Suddenly, Lydia gasped in shock. Moira caught her arm as the young girl stumbled backwards out of the shed, nearly falling into the mud, as Hunter had. “What? What’d ya see?” Moira asked quickly. “Blood! On the cart! On Allison’s cart! Near the corner!” Lydia said with a horrified voice. Hunter half-turned to look inside the shed again. With the door wide, the yellowish moonlight danced across the mud and over the cart itself. Just as Lydia described was the unmistakable smear of blood in the shape of a hand print. “Aye!” William shouted, already racing off into the night. This entry was posted on Sunday, February 7th, 2010 at 11:33 pm	and is filed under Bloody Business. You can follow any responses to this entry through the RSS 2.0 feed. You can skip to the end and leave a response. Pinging is currently not allowed.